When it dawned on Sunday morning, it was a beautiful day to begin with. The sun shone bright and so did Mehta Publishing House’s Colony Office. The occasion being, Ms. Sudha Murthy was to visit us for a splendid evening at our office. All the members of Mehta Marathi Granth Jagat and T-book Club were invited to be apart of this event. And what an evening it turned out to be….. Visitors started flocking the venue around 2:30 p.m. making sure they were well before time not to miss even a glimpse of a meeting with the dignitary. 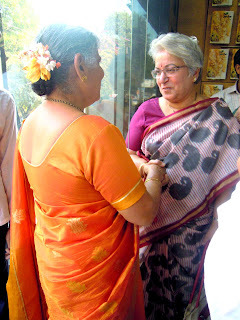 At around 3:30 p.m. Ms. Murthy walked in to our office escorted by Mr. Sunil Mehta – Director, Mehta Publishing House. She gladly walked into the venue with smiles and happiness as she took her seat at the special book signing table near the book shelves displaying all her past and latest titles’ editions. The noteworthy fact underlying here is that she had not been keeping well for some time and still she managed to take time out to interact with the readers which shows her commendability and dedication to writing. As she walked and took her seat there were cheers all around with happy faces among the crowds. While book signing sessions she gladly interacted with all the visitors and answered their queries many a times sharing her own experiences. 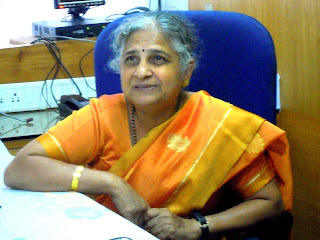 These included those from the college during her engineering days, challenges faced by a working women and importance of an understanding man in her life, about her passion for writing and even her fondness of a saffron color flower called ‘Son Chapha’ for she was amazed to find them in Pune during this season. Post the book signing, she was escorted to our office to interact with the staff and authors of Mehta Publishing House while having tea. Later she was felicitated with all the traditional Maharashtrian customs of haldi-kunkoo and offering of gifts and gazra to the married women. 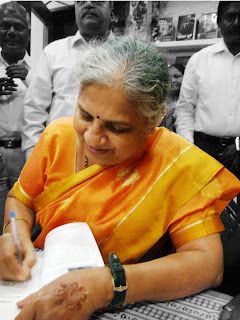 And thus ended the blissful and splendid evening of an interaction with Ms. Sudha Murthy. It is times like these when you realize the importance of the phrase that the tree bearing the sweetest of the fruits is the one that bends the most. Thus reflecting the fact that the most successful people are the most humble. Thank you ma’am for reminding us that yet again. We invite you to follow us on this blog dedicated to readers of Marathi books all across the globe. Your search for authentic Marathi literature ends here. We bring you the best of distinguished and coveted writers of Marathi books under one roof; some of them being V.P. Kale, Ranjit Desai, V.S. Khandekar, Anand Yadav, Vishwas Patil, Shanta Shelke, Shankar Patil, D.M. Mirasdar, Ratnakar Matkari and V. Madgulkar to name a few. Our non-marathi author list includes names like Sudha Murthy, Narayan Murthy, Kiran Bedi, OSHO, Dan Brown, Alistair MaClean, Robin Cook, Taslima Nasreen, Deborah Ellis ans S.L. Bhairappa to name a few. So lets celebrate of Reading with Mehta Publishing House !!!!!!!! !